Kat and Karl : STEP 4: FIND BACHELOR PARTIES! STEP 4: FIND BACHELOR PARTIES! 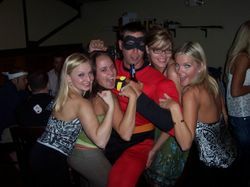 step 4. we take pictures with random bachelor parties in mr. incredible outfits. There's NOTHING like a grown man in a super hero costume.